From the main screen, the power of Word by Word Bible Dictionary is apparent. You can translate a Hebrew or English Bible word, browse the dictionary, cross-check a translation, view synonyms, surf the Concordance and within seconds of searching get a complete picture of any word in the Bible.This is a true work horse of a program - just the program you need! From the main screen, the power of Word by Word Bible Dictionary is apparent. You can translate a Hebrew or English Bible word, browse the dictionary, cross-check a translation, view synonyms, surf the Concordance and within seconds of searching get a complete picture of any word in the Bible. To start simply type in a word and its translations appear. The word can be typed in English and have the translation in Hebrew or vice versa, it will even handle the Aramaic words in the Bible. Languages and use can be a curious thing. The Bible in Hebrew cannot be literally translated word for word into English and always mean the same thing. The same word can be used to mean different things when viewed in context. Word by Word Bible Dictionary includes lists of all multiple meanings. Besides translations, Word by Word Bible Dictionary provides a list of synonyms in both Hebrew and English. 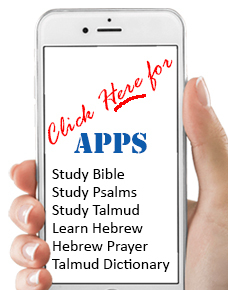 Click on any of the synonyms the their Hebrew or English translation will appear automatically, plus its Bible source. Use this system to help translate websites, business documents, school work and research. Take advantage of this technology to make your communications and correspondence more effective! This product is a "must" for those doing Bible Study. This is a true work horse of a program - just the program you need! Searches can be made from anywhere in the Bible text.